Actress and JDRF ambassador Brec Bassinger was diagnosed with Type 1 diabetes (T1D) when she was eight years old. Looking back on the days and weeks leading up to her diagnosis, Brec says the signs were there: extreme thirst, mood swings, weight loss, and more. The teen also remembers the moment her family knew something was wrong. Since her diagnosis and with an insulin regimen in place, Brec went on to be an active ‘tween and teen competing in track and field and cheerleading. At the age of 14, Brec’s passion for acting blossomed and took her to Hollywood, where she quickly landed a recurring role in the television series The Haunted Hathaways. Brec graduated high school early at 16, is attending college and currently starring in the new Hulu series All Night, and will soon be playing the title role in the DC Universe series Stargirl. Diabetes Self-Management and JDRF have a shared vision: to promote the advancement of diabetes research and spotlight diabetes champions in our community. In this one-on-one interview, Brec discusses her diagnosis and the importance of technology and self-management and offers insight into how she manages T1D while in school and on the job. DSM: When you were first diagnosed, were there any challenges? If so, what advice would you give a child of a similar age managing diabetes? Brec: I feel I was very blessed to be diagnosed at eight years old. I was old enough to understand what was going on, for the most part, but young enough to adapt quickly. I first managed my diabetes using insulin syringes but quickly switched to the pen. My advice to someone who is diagnosed around that age is to embrace it. Going back to school can be extremely challenging at first. But most people will not know much about diabetes and will be eager to learn. So don’t be afraid to talk about it and don’t hide it. It is now a part of you and you can celebrate that thing that makes you different. DSM: As an adolescent and teen managing T1D, how important is support [family, health-care providers, CDEs, dietitians, and more]? Brec Bassinger with actor and boyfriend Dylan Summerall at the JDRF 2018 Los Angeles Imagine Gala. Brec: Support, in my opinion, is necessary in all parts of life. But especially when it comes to T1D. When I was younger, my parents helped me out a lot with it. As I have gotten older, I have become more independent, but it is a lot to take on by yourself, so I have never been afraid to ask for help. I have done things like teaching my boyfriend how to get my shot ready. Simple things like that make it easier for me. DSM: You use a Dexcom CGM, and utilize the Dexcom mobile app, Dexcom Follow. Why are these tools important? And share an example of how these tools help you manage your diabetes. Brec: The Dexcom CGM has genuinely changed my life. It has made me realize how certain foods spike my blood sugar differently and helped me better control my numbers. It has allowed my parents to feel comfortable with me living alone. And it has helped me feel safer when doing things like working out or hiking. I never have to wonder what my blood sugar is. I can look on my phone and instantly know. DSM: Could you offer a few tips to effectively manage T1D while at school (K-12)? Brec: I worked very closely and even became friends with my school’s nurse. I was there so much, might as well be friends with them, right? I also made sure to let all my teachers know the first day. This communication prevented any conflicts when it came to low blood sugars or having to leave early before lunch to go to the nurse. DSM: You are currently attending college and a working actor. Please describe a typical day and how you effectively manage your diabetes. 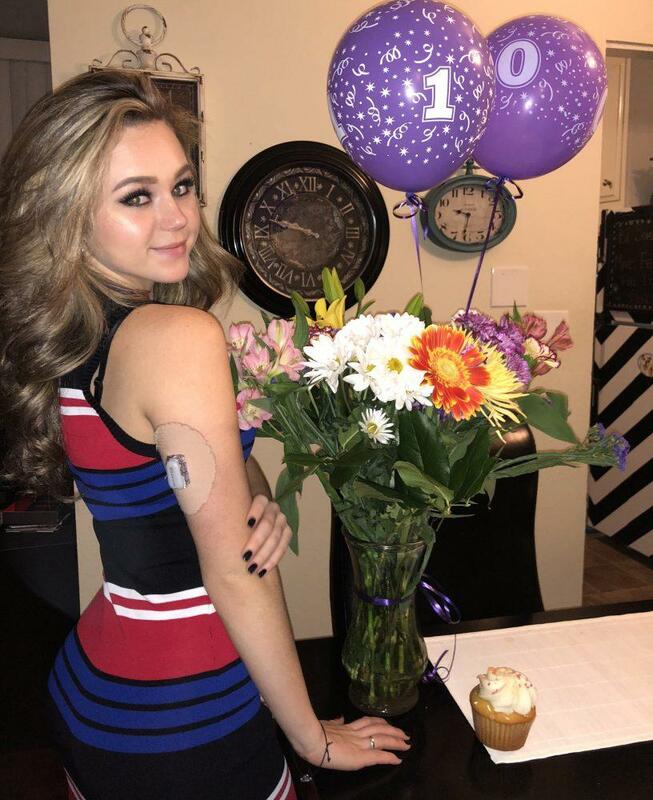 Brec Bassinger’s 10th anniversary managing diabetes. Brec: Being an actor, my day-to-day life changes immensely. A day on set can easily be 14 hours. I would tell the director about my diabetes on the first day of shooting so if any problem arises, we are prepared. A day where I am not filming may go something like this: wake up, eat breakfast (with shot of course). Work out. Get ready for the day. Go to my managers to get ready for audition. Go to audition. Come home and eat lunch. Then whatever else I have for the rest of the day. My off days usually include something fun like hiking, shopping, or going to see a movie. DSM: Why is it important to be a JDRF ambassador? Brec: I have been a JDRF ambassador for two years. It is so important to me for obvious reasons but also the community it has provided me. JDRF has allowed me to meet so many other people with diabetes and not feel like I am alone. It is so cool to meet other people who completely understand what you go through on a day-to-day basis. DSM: What advice would you offer children and parents managing (and co-managing) T1D? Brec: My advice is to try and take it one day at a time. Bodies are always changing and have a mind of their own, literally. Do not get upset if you have an off day. Some days will be great and others, not so much. But just show compassion to your body and yourself. To learn more about JDRF and the organization’s commitment to diabetes research, visit www.jdrf.org. Maureen McCarthy is editor-in-chief of Diabetes Self-Management.